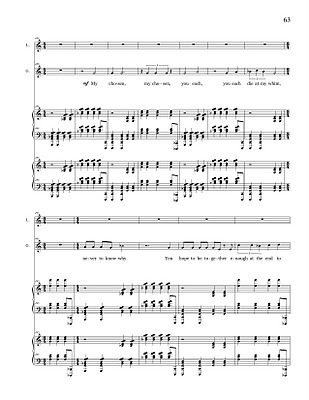 Working on the new opera, whose title has morphed into Certitude and Joy with various longish subtitles, and which is not to be confused with the orchestral piece of the same name, but which shares some of the same themes, especially the opening. In playing it for the wife and the director, the favorite section seems to be that whose accompaniment is an arithmetical average between two pieces: Regard du Père (Messiaen) and the introduction to the opera Irma (Gavin Bryars). It's a sentimental tune, sung by God to us the audience, describing his relationship to his prophets here on Earth. Some of the words - especially the section about how one wishes to have it all explained at the end - is from my mother. She wants this, she hopes she will get it, but she is absolutely sure that she will meet my father after her death. On his deathbed, my father told me that his greatest wish was that his children had a personal relationship with Christ, a desire he didn't achieve. My mother wishes the same, but has accepted the loss. 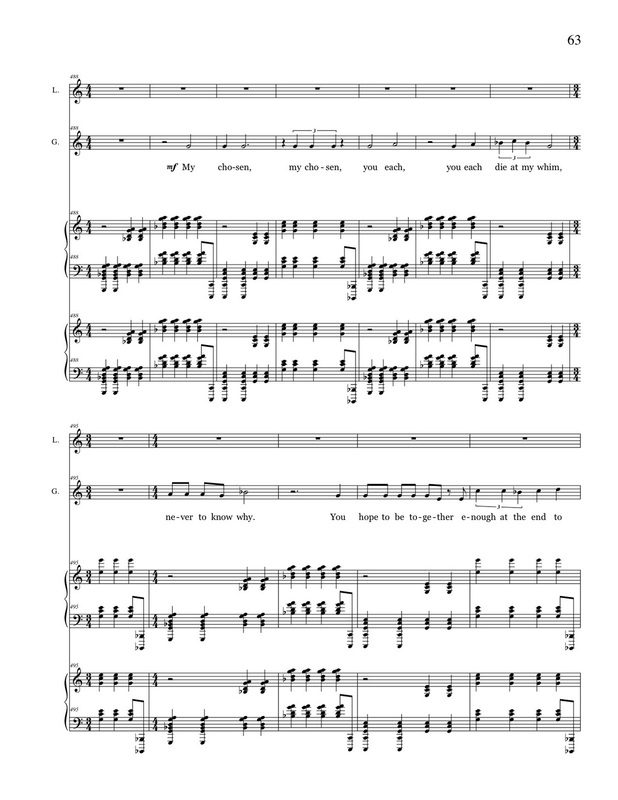 Working on setting of the words, I'm reminded of a question put to me by Charles Shere once on stage, during a meet-the-composer moment after a performance of the opening of Sub Pontio Pilato in a two-piano reduction, viz Did you write the words before or after the music? I fumbled the answer, feeling there was something wrong with the question, that the right answer was something like Oh, they both came to me at the same instant or Oh, they both were developed together, walking hand in hand down the aisle to the perfect consummation of text and sound. I've realized since then that, as with everything else, there are no rules, every process is OK. I often work in all possible ways: music first, words second, vice versa, both together, each running ahead and waiting for the other to catch up, revisions and sketches and quick outlines and everything else. Please remember this: there are no rules. There is good and bad, but there are no rules as to how to get there.